Flag Day is an official observance in the United Arab Emirates held on November 3 every year. It is dedicated to the President of the UAE Khalifa bin Zayed Al Nahyan who became head of state on November 3, 2004. The United Arab Emirates is a federation of seven emirates that was established in 1971. Although the head of state has the title of president, the UAE is in fact an absolute monarchy. The first president of the UAE was Zayed bin Sultan Al Nahyan. He held the post until his death on November 2, 2004 and was succeeded by his son Khalifa bin Zayed Al Nahyan. Sheikh Khalifa is known as a proponent of pro-Western policy oriented towards reform. Flag Day was established to celebrate his inauguration and to reflect on the achievements of the era of Sheikh Khalifa. On this day, people of the UAE remember the effort of the founding fathers and reaffirm their allegiance to the state flag, which symbolizes the country’s greatness and unity, as well as the aspirations for a better future. Flag Day in the UAE is marked with flag raising ceremonies accompanied by the national anthem. 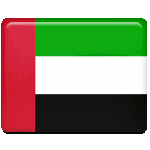 The flag of the UAE was officially adopted on December 2, 1971. It consists of a red vertical stripe and three horizontal stripes – green, white, and black. These four colors are known as the Pan-Arab colors, they represent Arab unity.